1.1: Color Map slot: This texture slot allows you to add your own Color Map (Diffuse/Albedo) texture to your model. A Color Map texture can include a so-called Alpha Channel which can be used for a variety of purposes. Please see section 6.5 below for more information. Knowledge Base: How do you add a Video Texture to a TV? 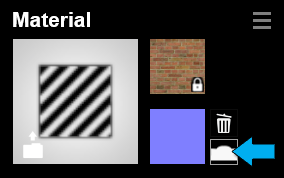 Please note that textures with the padlock icon can't be copied or saved to a material file as they were assigned to the model outside Lumion. 1.2: Normal Map slot: This texture slot allows you to add your own Normal Map texture to your model. Knowledge Base: How do you use the Normal Map generator? If your Normal Map contains an Alpha Channel, it will be used as a Gloss mask. This mask type supports 8 bits, i.e. all 256 greyscale tones in the Alpha Channel. 2.1: Colorization: Between 0 and 0.5, the Color Map is tinted more and more by the color in the color selector. Between 0.5 and 1, the texture of the Color Map is progressively replaced by the selected color. 2.3: Gloss: Change the Gloss slider value to sharpen or blur reflections. If you use a Gloss mask in the Alpha Channel of the Normal Map (Click here for more information), slider values of 0.0 corresponds to no glossiness (very blurry reflections) and 1.0 corresponds to whatever the greyscale value of the Gloss mask is. Slider values above 1.0 will multiply the Gloss mask value by 1x to x2 (the result is capped at 2.0). If no Gloss mask is present, it assumes that the mask is 100% white (i.e. fully glossy at a slider value of 1.0-2.0). 2.4: Reflectivity: Reflection amount. Between 1.0 and 2.0, the material switches to metallic reflections which will tint the reflections with the material color. If you use a Reflectivity mask in the Alpha Channel of the Normal Map (See section 6.5 below), slider values of 0.0 corresponds to no reflections and 1.0 corresponds to whatever the greyscale value of the Reflectivity mask is. Slider values above 1.0 will multiply the Reflectivity mask value by 1x to x2 (the result is capped at 2.0). 2.5: Relief: Material roughness - provided that the material uses a Normal Map. If you set the Scale slider to 0, the material will use imported texture coordinates from your 3D modelling application (Imported Texture Placement). If you set the Scale slider to more than 0, the material will switch to box mapping with automatically applied texture coordinates (Box-mapping Texture Placement). If you use a texture with a square shape (i.e. not rectangular) and you set the Scale slider to 1.0, the texture will cover exactly 1x1 meter on the model (assuming the model has not been scaled up or down). 3.1: X/Y/Z Offset: Adjust these sliders to change the position of the Color Map and Normal Map. This is only possible when the Scale slider value is above 0. 4.1: Heading/Pitch/Bank: Adjust these sliders to change the orientation of the Color Map and Normal Map. This is only possible when the Scale slider value is above 0. 5.1: Waxiness: Adjust this slider to change the waxiness of the material. The Waxiness function only works with sun light. Artificial light sources will not work. This is a known technical constraint. Just like in real life, bright materials will allow more light through than dark materials (that absorb the light), so black materials will not seem to have any effect, even when the Waxiness slider is set to the maximum amount. 5.2: Transparency: Adjust this slider to change the transparency of the model. If you use a Transparency mask in the Alpha Channel of the Color Map (See section 6.5 below), slider values of 0.0 corresponds to no transparency and 1.0 corresponds to whatever the transparency value of the Transparency mask is. 5-star Output Quality: 16 levels of transparency. 4-star Output Quality: 8 levels of transparency. 3-star Output Quality: 4 levels of transparency. 6.1: Emissive: A low value brightens the material and a high value makes it glow. If you add an Emissive mask to the Alpha Channel of the Color Map texture, the Emissive slider will only affect the masked areas (See section 6.5 below). 6.2: Saturation: A low value desaturates the Color Map texture and a high value makes it more saturated. 6.3: Specular: This slider allows you to boost specular highlights in the material. 6.4: Flicker Reduction: You should only use this setting if overlapping surfaces flicker or disappear when you move the camera. Avoid extreme Flicker Reduction values - you should only adjust it a little bit while holding down the Shift key and moving the mouse cursor left or right until the surface stops flickering. The best method is to make sure that your surfaces are offset a bit in your 3D modelling application, so that the flickering is less likely to occur in the first place. 6.5: Texture Alpha: The three buttons let you specify whether the Alpha Channel in your Color Map is used as a Reflectivity mask, a Clip mask or as an Emissive mask. By default, Lumion will set the second button - Color Map Alpha Clips Object - to on. Knowledge Base: How do you make some parts of a material more reflective? Knowledge Base: How do you make some parts of a material more emissive? 7.1: Weathering: This slider adds ageing and weathering effects, dirt, worn edges, moss and rust to materials. The first step is to select a Weathering Preset that matches the material you are using. Then set the slider value. A value of 0 means that the material is brand new. A value of 0.0 to 0.5 makes it look increasingly old. A value of 0.5 to 1.0 makes it increasingly dirty in addition to looking old. 7.2: Edges: This slider smooths the edges of objects. 8.1: Spread: Adjust this slider to change the distribution amount of the leaves. Knowledge Base: How do you prevent Foliage leaves from being too far apart on your model? 8.2: Leaves Size: Adjust this slider to change the size of the leaves. 8.3: Leaves Type: Adjust this slider to change the leaf type. There are 9 presets. 8.4: Spread Pattern Offset: Adjust this slider to randomize the distribution of the leaves on the model. 8.5: Ground Level: Adjust this slider if your model is above or below the Lumion Terrain. The slider value is in meters or feet depending in the chosen Units on the main Settings screen. Knowledge Base: How do you copy, paste, save and load materials? How do you make some parts of a material more emissive? What is the advantage of using DDS textures?